Early arrivals are Manuel and Celia Flores. Followed quickly by TONKAWA Vice President Jerry Starnes. Followed closely by Nellie Ruiz and El Bissara. Also in attendance are TON KAWA Treasurer Jean Vigenault and her Mother. Genevieve Bordeaux. More members kept dropping in to enjoy the air-conditioned comfort of the Many Nations, Chet Hunt Community room, facility. Meeting called to order by TONKAWA President Violet Tunohun at 11:30am. We had a respectable number of members and guests in attendance this Sunday. There was quite a bit of reminiscing about past TONKAWA members and the Sycuan Pow wow. TONKAWA member Gwen Cooper provided the luncheon blessing at noon. 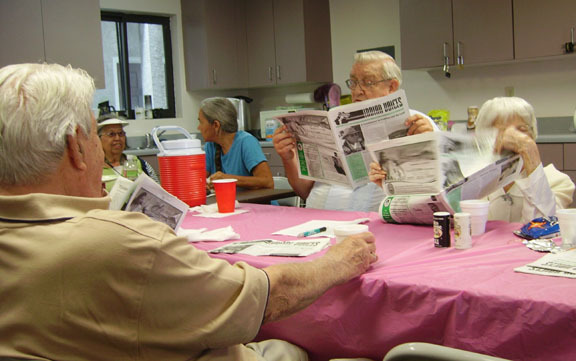 Indian Voices publisher Rose Davis, TONKAWA member, brought in the latest copy of the newspaper hot off the press! Good stories and great pictures of recent events. This is good company and great summer fare. Our terrific TONKAWA members continue to keep happy smiles and real good eats in this monthly potluck meal: Chicken dumpling stew, chili con carne, abondiga (meatball) soup, baked chicken. Sides of corn, peas, beans, cole slaw, sliced fruit selection, handmade tortillas, bread and butter. Iced tea and plenty of hot TONKAWA coffee to drink. 1. We realize the impact of canceling meeting therefore we will continue to have the TONKAWA meetings on the regular schedule, the second Sunday of the month. Next meeting: 11:30 October 11, 2009. 2. 2010 Census and the American Indian Health clinic activities on Thursday night. We cleaned up, packed up and while some TONKAWA members were still drinking coffee, talking and laughing, others went out the door by 1 pm. 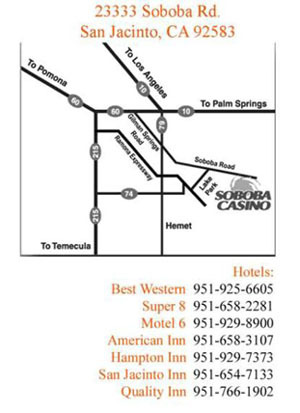 19th Annual Morongo Thunder & Lightning Powwow - September 25-27, 2009 Cabazon, California For additional information please call (951) 755-5340, Ext. 23800. Friday, Sept. 25th - Gates open at 4:00 p.m. Grand Entry at 8:00 p.m.
Saturday, Sept. 26th - Gates open at 10:00 a.m. Grand Entry at 1:00 p.m. and 8:00 p.m.
Sunday, Sept. 27th - Gates open at 10:00 a.m. Grand Entry at 1:00 p.m.
Open to the Public. Admission and parking is free. Remember to 24/7 look to the TONKAWA-American Indian Source site for the calendar of upcoming events. Click on the link below now. Maybe we will see you and a friend (We are always recruiting Elders to be TONKWA members!). It is always nice to see new members and guests drop in and are encouraged to return. This is a very nice down home meeting to attend. 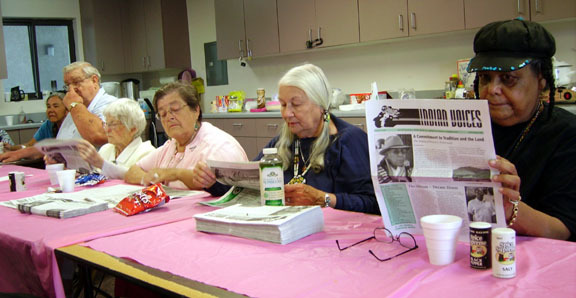 We are also very pleased to enjoy the regular attendance of TONKAWA along with community guests and family members.